Kearney, Neb. 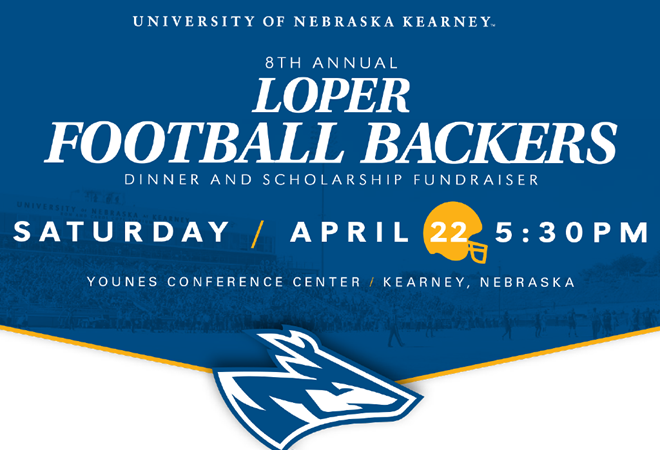 – The 8th Annual Loper Football Backers dinner and scholarship fundraiser is set for Saturday, April 22nd, at the Younes Conference Center in Kearney.Since it was first hosted in 2010, the event has raised over a million dollars for scholarships and other program needs. Last year, an all-time high of $228,000 — or the equivalent of 13 in-state scholarships — was raised. The program starts with a 5:30 p.m. social hour, followed by dinner and silent auction at 6:30 p.m. and live auction at 7:30 p.m. Tickets, which are $50 per person and include dinner. Tickets can be purchased online, by filling out an order form and mailing in, or by calling Rich Broderson at (308) 698-5274. Corporate tables that seat nine, plus a current UNK football student-athlete, are available for $500. The Loper Football Backers is a community-led volunteer organization whose mission is to raise scholarship dollars for the UNK Football program. The Loper Football Backers are always looking for new members to help. All monies raised benefit student-athlete scholarships. The Loper Football Spring Game will be held on April 22nd as well at 11:30 a.m. at Cope Stadium. The Spring Game is open to the public.